WE STARED. HARD. White rocks on the mountainside ahead were definitely moving. As the Zodiac plowed doggedly through the icy waves of the Torngat fjords, we fixed our binoculars and sharpened their focus. Slowly, the moving rocks became what we’d set out to find – polar bears. As we watched, the sound of our motor woke a mother bear from her afternoon nap to nudge two dozing cubs. Together, in a show of supreme indifference to our bobbing boat of paparazzi, they turned their backs and began to lumber up the mountain. Massive yet surprisingly nimble, they found footholds in what looked to us like a sheer drop. Shutters clicked madly to capture last moments, until the bears went over the proverbial mountain. 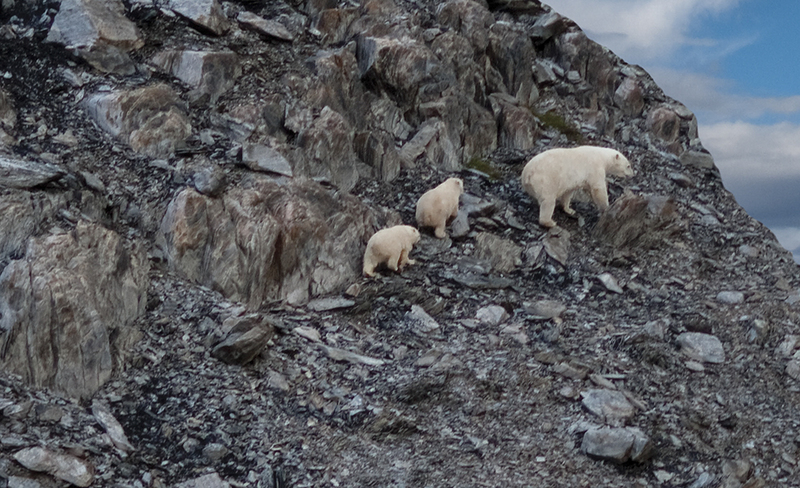 Polar bears sighted on the mountain. Photo courtesy of: Newfoundland & Labrador Tourism / Barrett & Mackay Photo. 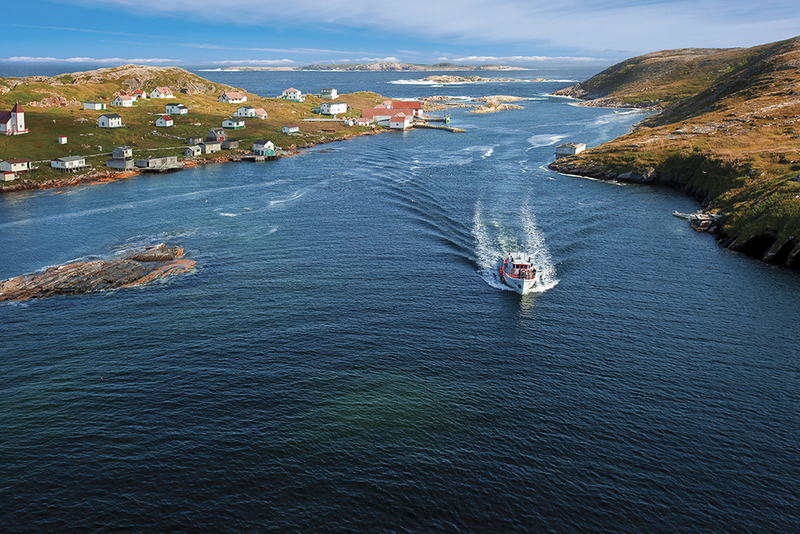 Set out on a One Ocean Labrador and Torngat Mountains Explorer expedition, and you’ll soon learn that the far north demands your undivided attention. Whether you’re wrestling into a survival suit to keep you afloat if your kayak tips, or carefully navigating a steep mountain hiking trail, you’re thoroughly in the moment. It takes mindfulness to a whole new level. Every day is a different adventure and a fresh immersion into the history, culture and landscape of Canada’s rugged north eastern coastline. I’ve sailed on a wide variety of ships over the course of my travel writing career but never anything quite like the rugged icebreaker that would be home for our ten-day exploration. Her sturdy construction more than made up for any lack of decorative flourishes – we knew she’d plow through any icy challenges ahead. Though the crew spoke mostly Russian, communication was easy – lots of friendly head nodding and big smiles. Exploring by zodiac. Photo credit: Liz Fleming. Accommodations were a mix of two and three-person rooms, many with bunk beds and some with shared bathrooms, but I got lucky. Because I was a solo sailor, I was given the cabin usually reserved for the pilots who come aboard for short periods to guide the ship into port. My room gave a whole new meaning to the word ‘compact.’ Standing in the middle, I could touch both walls, reaching over my slim, single bed. A desk big enough only for my laptop and a plug-in kettle sat under the window, my survival suit and lifejacket hung on wall hooks and there was just enough room to stuff my duffle bag under the bed. The bathroom was a marvel of space efficiency, with a shower head and taps on one side and a sink, toilet and mirror on the other. To shower, I tossed towels, toilet paper and anything else I didn’t want soaked onto my bed, closed the door and cranked on the taps. My bathroom became my shower. Perhaps not the best arrangement for anyone with claustrophobia but I loved lying in my tiny bed, listening to the waves – alone in my own crow’s nest – and slept deeply every night. Battle Harbour, Labrador. Photo courtesy of: Newfoundland & Labrador Tourism / Barrett & Mackay Photo. That is, I slept deeply after long evenings spent listening to interesting lectures about the land we were sailing past and the people and wildlife we’d be encountering, competing valiantly (if not always successfully) in trivia games, and singing my brains out with the impromptu guest/crew bands formed by those smart enough to bring along fiddles, guitars and mandolins. It felt like camp – no fancy theatre, floorshow, or piped-in music. 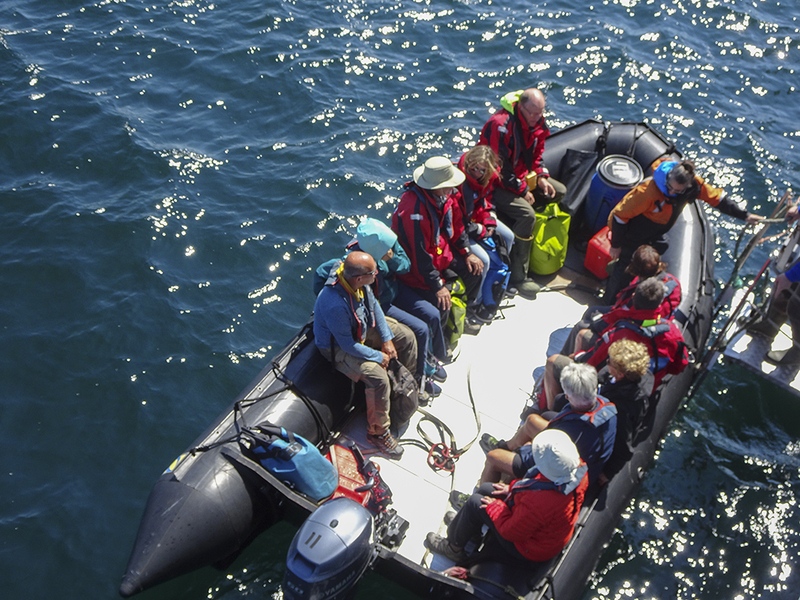 One Ocean staff is outstanding – clever, funny, motivating – and they enjoy a dynamic partnership with the Royal Canadian Geographic Society that adds an important level of expertise to onboard presentations. The itineraries seem to attract smart, inquisitive, extroverted people eager to share stories, learn about the world and generally have a great time, so much as I loved my bed, I rarely got to it before midnight because there was simply too much fun to be had. Days started early with hearty breakfasts in the dining room. No assigned tables, you simply showed up, sat in the first empty place and dove into a conversation about our most recent adventure. 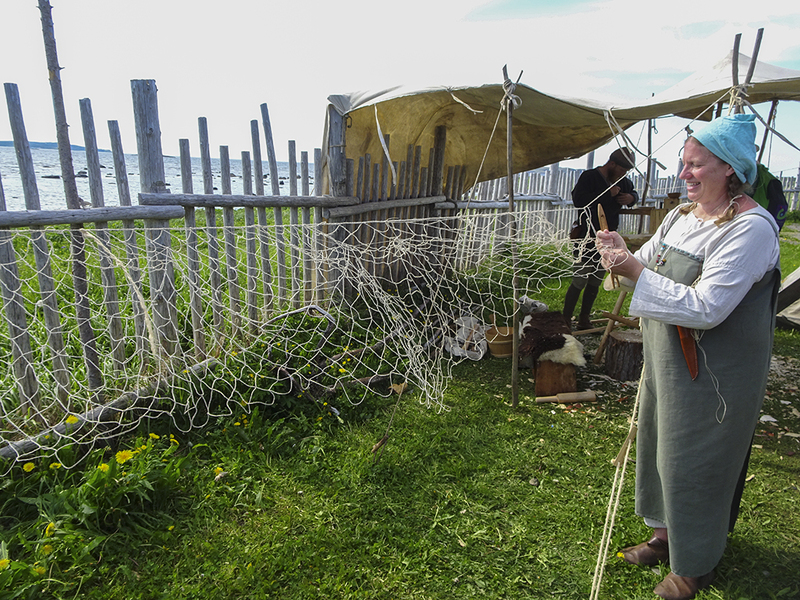 Hand-tying fishing nets in L’Anse aux Meadows. Photo credit: Liz Fleming. We began with a bang – quite literally – suiting up in period uniforms to fire muskets at the Fortress of Louisbourg National Historic Site, on the shores of Cape Breton Island. The blast was deafening, but it was the itchy wool that convinced me I wouldn’t have made it big in the 18th century militia. History was also centre-stage for our visits to the small Labrador communities of Battle Harbour and Hopedale where it seemed every resident turned out to greet us. Children and elders taught traditional Inuit games – most of which we played very badly, to their immense amusement! The welcomes were warm and the restored fishing and whaling buildings, small shops and churches perched on the ancient rocks of the Canadian Shield were fascinating. Local crafters and artisans set out their wares and more than a few seal skin slippers and mitts, hand-carved horn necklaces and exquisite paintings made their way back to the ship. 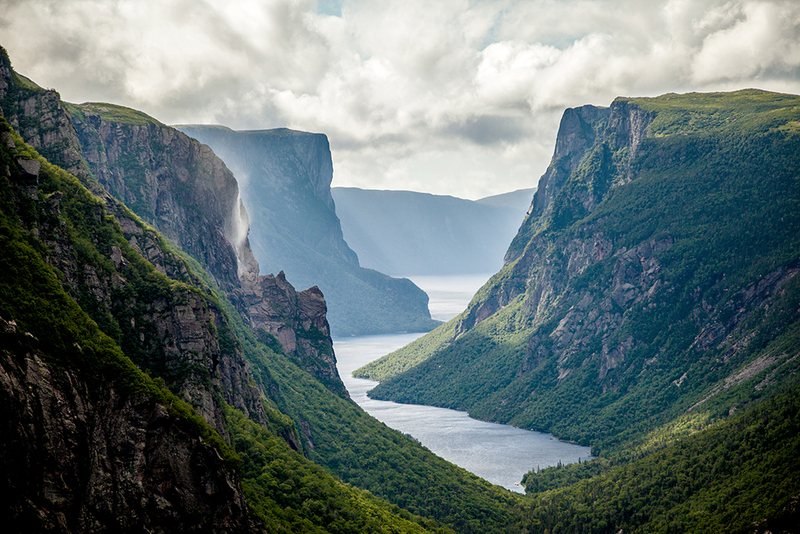 Western Brook Pond Fjord, Gros Morne National Park. Photo courtesy of: Newfoundland & Labrador Tourism. Perhaps the most breathtaking step back in time was our landing at L’Anse aux Meadows, in northern Newfoundland. Hailed by costumed latter day Vikings hand-tying nets in the fresh breeze, we wandered through the grassy remains of Leif Erikson’s winter encampment, staring at the imprint of the dirt floors of his sod hut and imagining we could smell the wood smoke from his long-ago fires. Some One Ocean experiences bring guests face-to-face with the mistakes of the past. 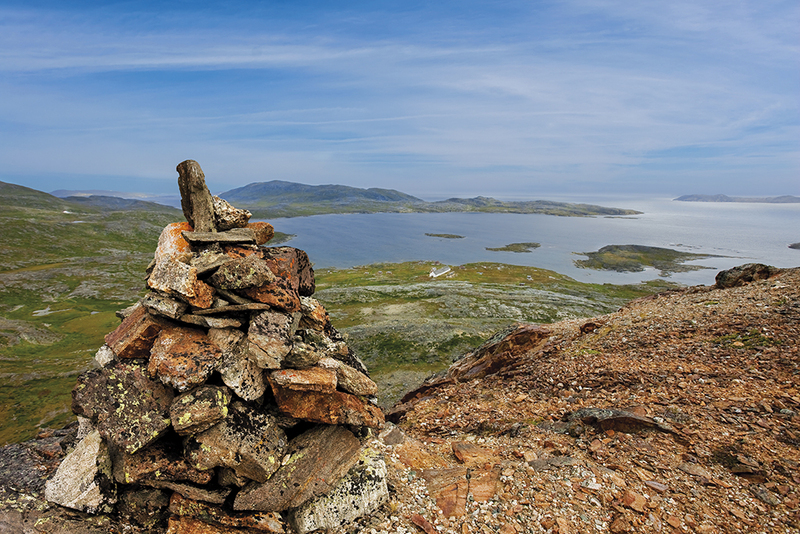 In Hebron, we visited the ruins of a once-thriving missionary community tucked far into the Torngat Mountain fjords. There, Inuit families and Moravian missionaries had built a church, a school, homes, a Hudson’s Bay trading post – and a life. In 1959, the government decreed that Hebron was too remote to maintain and moved all the inhabitants to other Inuit communities. So little care was taken in planning, however, that families were separated arbitrarily, sometimes by many hundreds of miles, for decades, with no hope of being reunited. Many died without ever seeing their relatives again. A commemorative plaque offers the government’s too-little-too-late apologies while beside it, another plaque placed by the Inuit families, finally reunited on the plaque commemoration day, offers their forgiveness. Reading it is humbling. The abandoned missionary community at Hebron. Photo courtesy of: Newfoundland & Labrador Tourism / Barrett & Mackay Photo. From hiking in the wilds of Newfoundland’s stunning Gros Morne National Park, to kayaking near Button Island, the only known landing site of a German U-boat during WWII, every day was exciting, but our time in the remote Torngat Mountains of Labrador, where the polar bears ruled was the high point. In fact, as we passed the towering Monument Island and sailed into Frobisher Bay, on our way to our final port in Iqaluit, we were subdued as if the adventure was at an end. We shouldn’t have worried. The next morning, we woke to a dazzling blue sky, brilliant sunshine and a world of ice. Stretching endlessly from ship to shore, massive ice pans shifted and groaned, punctuated here and there by vivid aquamarine melt-water pools. As the sun beat down, coats were peeled off and exchanged for bathing suits as we hopped into the on-deck hot tub. It was the arctic and One Ocean Expeditions at their finest, creating an amazing send-off – a stunning moment of ice and sun. IF YOU GO One Ocean Expeditions offers a selection of adventure cruises in the Canadian and Norwegian Arctic, Antarctica, Scotland, Iceland, Greenland, South and Central America and beyond. No need to worry about packing extreme weather equipment – you’ll be provided with survival gear, a life jacket, rubber boots, binoculars, backpack and Nordic walking stick. For complete information, visit oneoceanexpeditions.com and see your travel professional for assistance. Written by Liz Fleming. Originally published in Cruise & Travel Lifestyles Fall/Winter 2018 issue. Main photo: Iceberg in Torngats National Park, courtesy of Newfoundland & Labrador Tourism. The PONANT app is launched!